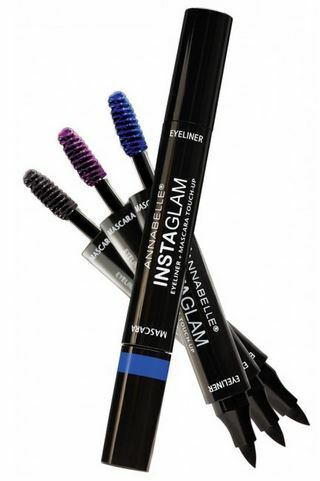 Annabelle Instaglam Eyeliner + Mascara Touch-Up - $12.95 - a two-sided liquid liner/mascara combo that saves tons of room in your purse making it the perfect item to carry around for touch-ups or to change your look from day to night. One side is an oversized marker-pen with a felt tip applicator designed for ultimate precision, control and versatility. The perfect tool to achieve thin natural lines to dramatic shapes in one stroke. The other side sports a mascara which offers a small brush for ultra-precise and flexible application, wrapping even the tiniest lashes. Curling and defining formula and buildable texture. If you are looking for serious length or volume you don't want to be using the mascara on its own, the brush just isn't built for it, I did 3 coats to get this much volume - but if you are looking to touch up your regular mascara after a long day or for one that will easily get the bottom and corner lashes without hitting skin, it's perfect for that! Available now at drugstores across Canada and online at www.annabelle.ca.